Tags: Arkansas, congress, earmarks, Housey show more tenacity in opposing hidden earmarks. Tags: Nancy Pelosi, pork, pork-barrel spenders To share or post to your site, click on "Post Link". Please mention / link to the ARRA News Service. Thanks! Others concerned for assault on our basic freedoms. Beyond our previous post today, other grassroot orgs are expressing concern over members of Congress who want to take advantage of the current demands for "lobbying reform" and then who go beyond this to implement provisions that would actually be a restriction on the type of grassroots activism. Proposals that are legitimate responses to recent allegations of certain unethical actions by Members of Congress, congressional staff and lobbyists are not an issue. But nothing in those allegations provides any justification for the notion that Members of Congress should seize authority to scrutinize and regulate the constitutionally protected efforts -- of groups of conservative grassroots groups or even the liberal groups like MoveOn.org -- to alert citizens regarding legislative developments in Congress, and to encourage citizens to communicate their views to their elected representatives. The First Amendment protects the right to "petition the government," and such activities are at the heart of our republic. Public Citizen, a liberal government watchdog, supposedly helped Pelosi draft the legislation and wants lawmakers to adopt the Internal Revenue Service's definition of "lobbying," which includes communication that encourages the general public to contact a member of Congress on pending legislation or public policy. In addition to today's previous posting, you can READ MORE on the controversial features of the bill and this assault on our most basic freedoms. Send this post to everyone you know who wants to help tell Congress to support free speech rights and oppose restrictions on grassroots activism. In addition to the link in the prior posting which provided a means to contact your legislators, you may also do so through the following "ACTION ALERT" link. Tell Legislators to Support Free Speech! Thank you! Today's NRO interview (12/16/06) provided the most detailed explanation yet of Governor Romney's journey to the pro-life cause. Tags: Election 2008, GOP, Mitt Romney, presidential candidate, pro-life, Republican To share or post to your site, click on "Post Link". Please mention / link to the ARRA News Service. Thanks! Did Gov Mitt Romney (R-MA) chose to support 'gay' marriage? 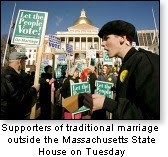 Tags: Election 2008, Massachusetts, Mitt Romney, parent rights, presidential candidate, Republican To share or post to your site, click on "Post Link". Please mention / link to the ARRA News Service. Thanks! Phyllis Schlafly -- President Bush pardoned 16 criminals including five drug dealers at Christmastime, but so far has refused to pardon the two U.S. Border Patrol agents who were trying to defend Americans against drug smugglers. It makes us wonder which side the self-proclaimed "compassionate" president is on. Border Patrol Agents Ignacio Ramos and Jose Compean were guarding the Mexican border near El Paso, Texas, on Feb. 17, 2005, when they intercepted a van carrying 743 pounds of marijuana. For what happened next, they were convicted and sentenced under a statute that was designed to impose heavy punishment on criminal drug smugglers caught in the commission of a crime. The government chose to believe the drug smuggler rather than Border Patrol agents with clean records. Ramos was nominated for Border Patrol Agent of the year in 2005, and Compean served honorably in the Navy before joining the Border Patrol. Tags: border guards, Ignacio Ramos, illegal immigration, Jose Compean, pardon To share or post to your site, click on "Post Link". Please mention / link to the ARRA News Service. Thanks! Was Saddam Hussein involved in Oklahoma bombing? WorldNetDailyD. James Kennedy, author, theologian, biblical scholar, pastor of the 10,000-member "Coral Ridge Presbyterian Church" in Fort Lauderdale, Fla., and founder of the highly influential Coral Ridge Ministries, suffered a major heart attack last night and is in grave condition, ministry officials tell WorldNetDaily. According to Mary Ann Bunker, Kennedy's long-time personal assistant, the 75-year-old religious leader had a "severe" cardiac arrest last evening . . . [Click for more] Our Prayers go out for Dr. Kennedy& his family! Tags: D. James Kennedy, Christian, evangelist To share or post to your site, click on "Post Link". Please mention / link to the ARRA News Service. Thanks! John Edwards tried to cozy up to America's poor by announcing (his presidential candidacy Thursday in the Lower Ninth Ward of Hurricane Katrina-ravaged New Orleans. It's doubtful that any on hand live in splendor comparable to the $3.1 million mansion the former senator and vice presidential candidate is building in North Carolina. Edwards, worth upwards of $30 million thanks to a career as a personal injury lawyer, is building the home on a 100-acre estate outside Chapel Hill, the New York Post reported. The 10,700-square-foot mansion boasts 10 rooms, 6 1/2 baths, two garages, and verandas with sweeping views of the surrounding countryside. Tags: Election 2008, Democrat, John Edwards, presidential candidate To share or post to your site, click on "Post Link". Please mention / link to the ARRA News Service. Thanks!